Folger manuscripts W.b.110 and W.b.111 are an oddly mis-matched pair. W.b.110 is nearly 46cm tall (almost 18 inches, for those playing along at home) and nearly 160 leaves, while W.b.111 is a good 10cm shorter and about a third the length. But both have nearly identical titles in our catalog: “Bills and receipts for the wardrobe, stage properties, writings and printing” (W.b.111 adds that they were “used in productions of Shakespearean and other plays” but the same is true of the contents of W.b.110 as well). W.b.110 and W.b.111—an odd pair. 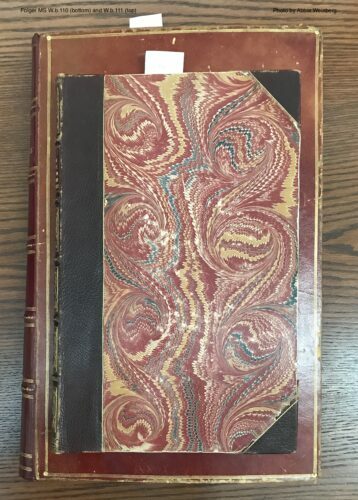 Both volumes cover the theatrical seasons for the mid 1710s at the Theatre Royal, Drury Lane, and together they provide a fascinating look into the wide variety of objects, processes, and people that went into a professional theatre production in the early 18th century. They are, of course, not without problems and caveats: one of the Associate Name headings on both of the catalog records is “Halliwell-Phillipps, J. O. (James Orchard), 1820-1889, former owner.” This should be setting off alarm bells for quite a few readers right now. 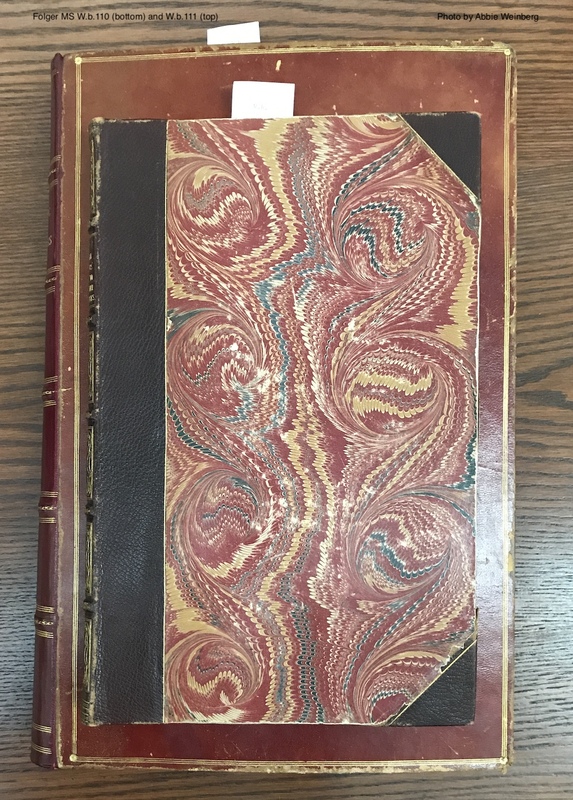 W.b.110 and W.b.111 are, indeed, two Halliwell-Phillipps scrapbooks: documents gathered together (and sometimes deliberately ripped apart) by this 19th century antiquarian and literary scholar, and compiled for posterity with more or less organization and deliberation. These two volumes definitely fall into the “less” category, as there are few discernable organizing principles and some bills that are clearly related are pasted into completely different places in the volumes (such as laundry bills, which were divided into men’s and women’s clothing but were billed in one total). 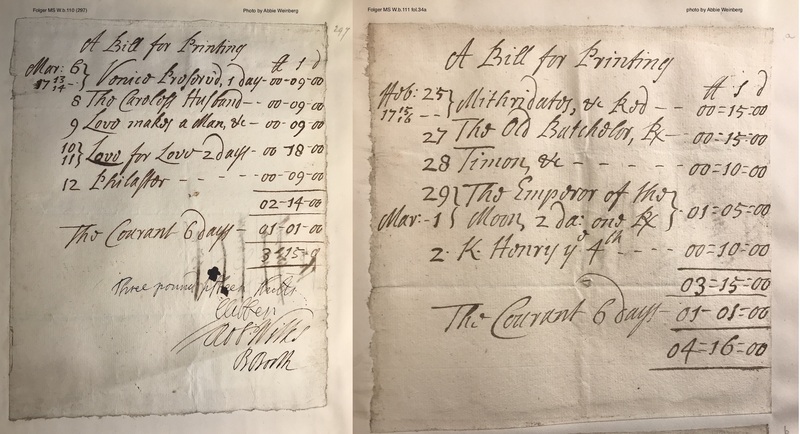 For me, one of the most interesting finds were twenty-three bills “for Printing” scattered throughout the two volumes. Caroline has already looked at Drury Lane’s own in-house print shop from about a century later, but these bills show that, at least in the early 18th century, much of the advertising printing was sent out. The twenty-three surviving bills certainly represent only a fraction of the printing costs that the theatre incurred in a season, but do seem to give a nice representative spread for the time period January 1714 to May 1716 (which would be two and a half theatrical seasons). The spread also provides some interesting economic information: since the bills are relatively consistent in what is being printed—advertisments (probably in the form of playbills) for the shows for the week and daily adverts in the London Daily Courant—it is possible to see how much the cost of printing went up over about two years. Cibber, Booth, and Wilks all signed nearly all of the bills in this collection. Other names are also scattered about the bills. Names of the people providing the goods and services to the theatre are frequently seen. Two names in particular caught my eye: those of Sarah Norris and Mary Kirkham. 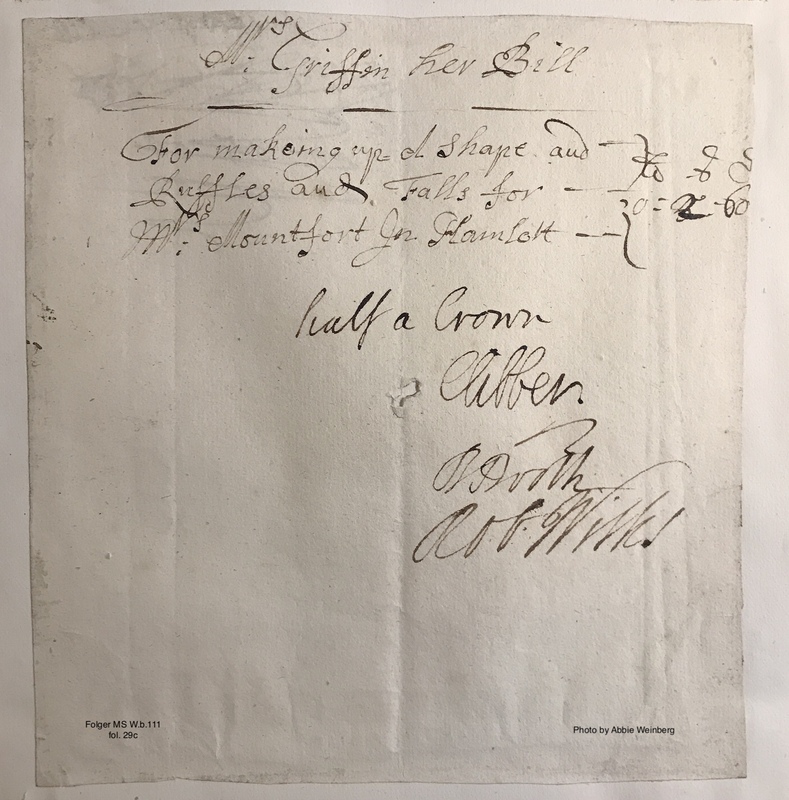 Both of these women appear on multiple bills throughout the two volumes, but what really caught my eye is that they’re most often found at the bottom of the bills, signing (or possibly countersigning?) with the triumvirate. Mary Kirkham’s position is a bit more difficult to figure out. 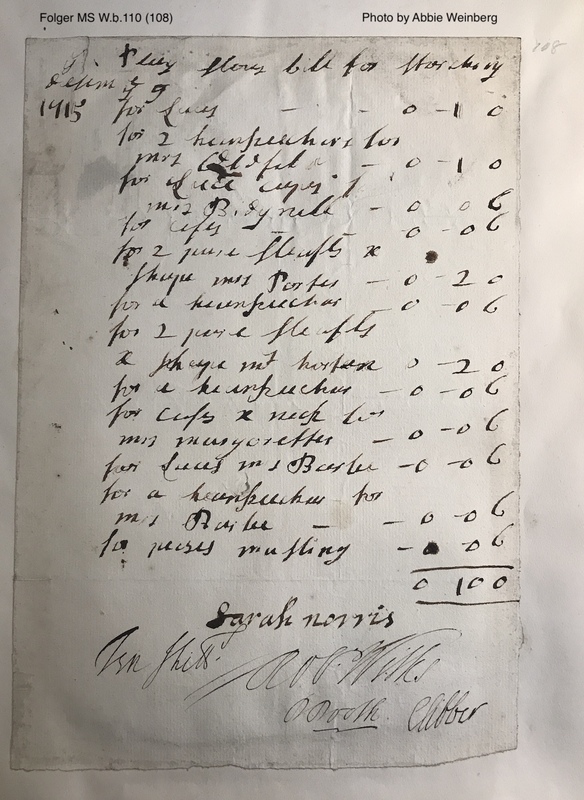 Her signature appears on the bills for the oil and candles that provided the light in the building. In fact, it appears on over forty such bills in this collection! Which makes sense as both types of fuel were delivered to the theatre on a weekly basis. Highfill’s Biographical Dictionary of Actors and Actresses… (a critical—but problematic—resource for theatrical history) has the following to say about Kirkham: “Mary Kirkham is named occasionally in the Drury Lane accounts at the FSL, but it is not clear what her position was in the theatre, or indeed, if she was actually on the theatre staff. 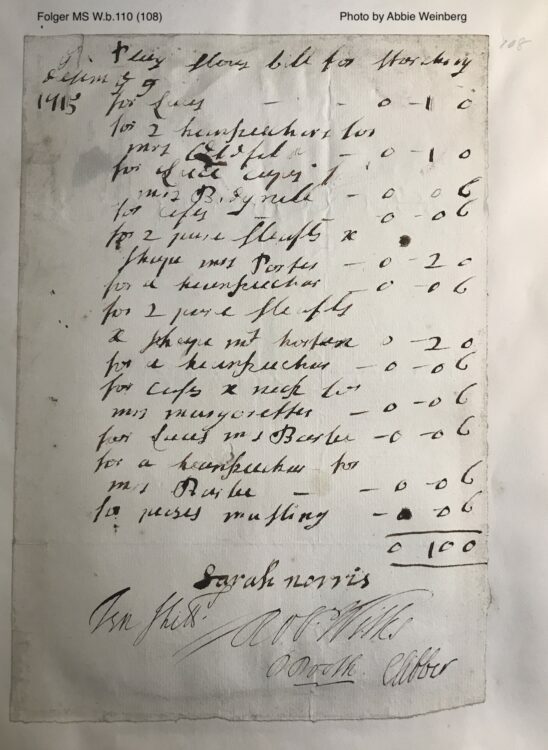 But she seems to have been a house servant about 1715.” However, as I have been surveying this subset of these bills, I’m growing more and more skeptical about the claim of “house servant”. I will need to do a lot more digging and investigating to try to sort out what Kirkham’s actual position might have been, so stay tuned for a follow-up. Combining the information found on this bill with that found in The London Stage (a key reference work for 18th and 19th century theatrical performances, which has now been turned into a searchable database) and Highfill’s Biographical Dictionary tells us that the “Mr Sorin” who was using said guitar was likely the dancer Joseph Sorin. 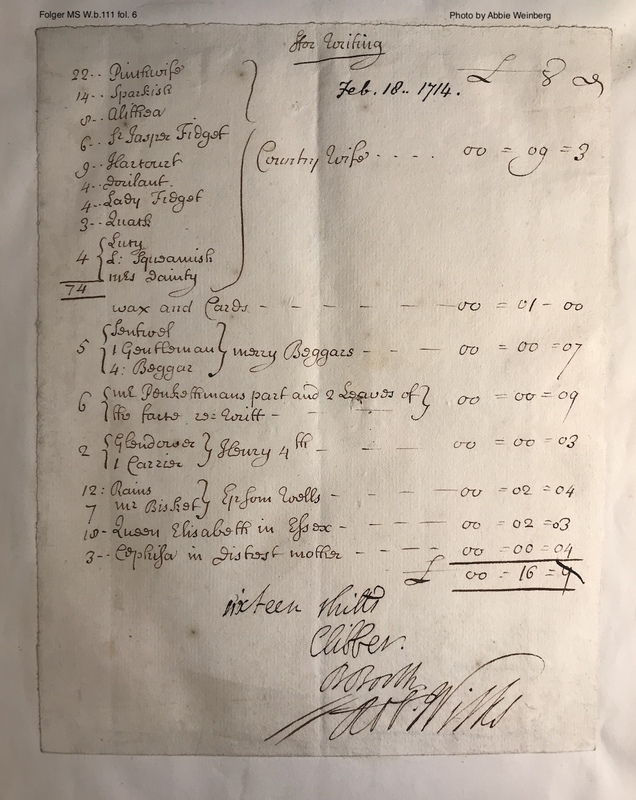 He, along with his partner Richard Baxter, had their benefit night at Drury Lane on Friday April 20, 1716; the night included an unnamed dance piece, an Italian(?) pantomime (which seems to have been Sorin’s specialty) called “La Guinquette,” and a performance of Congreve’s The Old Bachelor. Using these bills in conjunction with other theatrical history resources, like the ones just mentioned, can help us enrich our understanding of the complexity of 18th century theatre. Judith Milhous demonstrated this beautifully in her article “The First Production of Rowe’s ‘Jane Shore'” (Theatre Journal, Vol. 38, No. 3, (Oct., 1986), pp. 309-321). And sometimes, it gives us a window into the weird and wacky world of the theatre. Haven’t you always wanted a monkey? 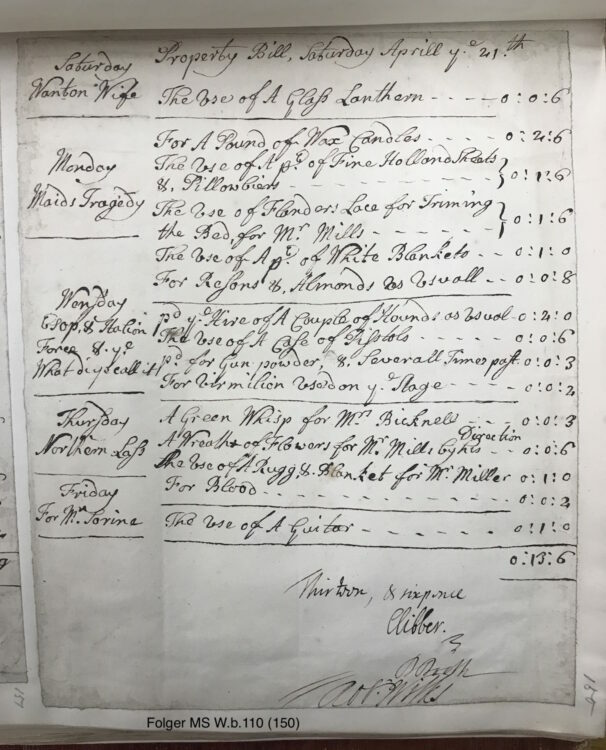 Judith Milhous, “Dates and Redatings for 141 Theatrical Bills from Drurpy Lane, 1713-1716,” (The Papers of the Bibliographical Society of America, Vol. 79, No. 4 (Fourth Quarter, 1985), pp. 499-521). Milhous, “Dates and Redating,” p. 510. Batty, Mark. 2004 “Booth, Barton (1681–1733), actor.” Oxford Dictionary of National Biography. 9 Jan. 2019. and Milhous, “Dates and Redating,” p. 500.